67% of customers have hung up the phone out of frustration because they could not talk to a real person (American Express Research), and 89% are ‘more satisfied’ when they get answers online quickly(Synthetix research report). In our last post “Beating the Goldfish” we shared some insights on the power of video portals in driving engagement and also shared some great real-life stats from one of our customers, ExactTarget. My favorite outcome for ExactTarget was that they were able to drive a 100% increase in time on site and engagement by adding a video portal experience. It doesn’t take much for most people to recall similar experiences and frustrations with traditional phone support. So how are organizations solving this problem and where does video fit into the mix? As the most compelling type of content, a video portal can have a major impact on customer satisfaction, repurchase behavior, and overall profitability. 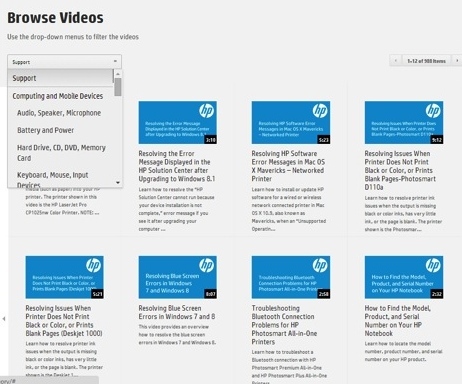 A fantastic example of a great video portal for support comes from technology leader HP. Offering the broadest technology portfolio that spans printing, personal systems, software, services, and IT infrastructure, HP delivers solutions for customers’ most complex challenges in every region of the world. With all of these solutions, world class product support is a very high priority. There are many superb features in HP’s video portal implementation, which you can get a glimpse of in the screen shot below. First, their ultra-clean navigation provides lots of great options to browse and find content from with suggested videos and expanded help text. HP also offers a variety of viewing options from closed captions and accessible players. And finally, there is a lot of content that ranges from just a few seconds to 15 minutes and over. Regardless of the duration, this content is direct and helpful with no fluff added.